This post looks at where branches of Banamex (Banco Nacional de México) were founded in the period prior to 1960. Banamex is one of the oldest banking institutions in Mexico. It is now a subsidiary of Citigroup, but remains the second largest bank in the country after BBVA Bancomer. Banamex was formed on 2 June 1884 from the merger of Banco Nacional Mexicano and Banco Mercantil Mexicano, two banks that had only been operating for a couple of years. Shortly after its founding, Banamex had branches in Mexico City, Mérida, Veracruz, Puebla, Guanajuato, San Luis Potosí, and Guadalajara. The maps to the left are based on Figure 8 of Las Regiones Geográficas en México by Claude Bataillon (8th edition, 1986, Siglo Veintiuno Editores). Each dot represents the location of a branch of Banamex in the year shown. For simplicity’s sake, it is assumed that all branches present on any earlier map continued to exist through to 1960, and did not close or relocate in the interim. The concept of spatial diffusion looks at the spread of an innovation, whether a new idea, technique, good, service or brand. The spatial diffusion of information or of the adoption of innovations is an important subset of spatial interactions. Looking at the spatial diffusion of a banking network offers lots of interesting insights into how Mexico’s economic geography has changed over the years. There are three basic types of diffusion. The first is relocation diffusion where people travel or migrate and bring their cultural and technological practices with them. For example, modern studies in the genetics of corn (maize) have established that ancient Mexicans first domesticated corn in the Balsas valley. They then migrated both northwards and southwards, taking the practice of cultivating corn with them. The second is contagious diffusion, which generally spreads from person to person and exhibits strong distance decay. An example is the spread of the Jehovah’s Witness faith in Mexico which required a considerable amount of face-to-face personal interaction. Many diseases also spread by contagious diffusion. The third is hierarchical diffusion, which spreads across higher levels of a hierarchy and then down to lower levels. This is often how information from the top of an organization reaches those at the bottom. An example is the government’s 1970s family planning program that was first adopted in large cities, then smaller cities, and eventually penetrated into rural areas. Combinations of these three types are also possible. One relatively recent example is the spread of the H1N1 influenza virus in early 2009. First reports were that it started in a rural village, probably in Oaxaca, and spread by contagious diffusion to others in the village. From there an infected person temporarily relocated to Mexico City where the flu again spread by contagious diffusion. From Mexico City, the top of the Mexican hierarchy, it spread down the hierarchy as carriers of the virus traveled to smaller Mexican cities and to other cities worldwide. In the case of the diffusion of Banamex branches shown on the maps, the main type of diffusion involved is hierarchical. In this case, given that Banamex is a banking institution, the hierarchy reflects where most economic activity is taking place at the time. (There would be little point in placing a new branch in a location where little money was in circulation). The 1930 distribution of Banamex branches looks to be quite scattered across the country, though Baja California and north-west Mexico have no branches and fall outside the network. By 1940 more additional branches have opened in the northern half of Mexico than the southern half, and the north-south economic divide that we have commented on in many previous posts is beginning to become apparent. Between 1940 and 1952 many new Banamex branches are added in central Mexico (this is the period when in-migration was turning Mexico City into a monster) and along the west coast, following the line of Highway 15 which runs from Guadalajara to the border with California. Overall, the north-south divide is now quite clear. Between 1952 and 1960 additional branches open close to the US border, a branch finally reaches Baja California Sur (in La Paz) and the economic dominance of northern Mexico over southern Mexico is clearly established. One of the most striking features, when comparing all four maps, is how the number of Banamex branches in southern and south-eastern Mexico (defined as the states of Chiapas, Tabasco, Campeche, Yucatán and Quintana Roo) barely changed between 1930 and 1960. It would be interesting to update this example with similar maps for more recent years. Please contact us if you have access to suitable data or know where such data may be found. Another instance of diffusion, of cholera in Mexico during the 1991-1996 epidemic, is mapped and discussed in chapter 18 of Geo-Mexico: the geography and dynamics of modern Mexico. Geo-Mexico also includes an analysis of the pattern of HIV-AIDS in Mexico, and of the significance of diabetes in Mexico. Geographic Travels, one of my very favorite Geography blogs, recently posted a photo of a Mexican Christmas Tree, accompanied by a short history claiming that the Christmas tree was first introduced into northern Mexico by German industrialists and others. That may be a popular notion, but the true history of Christmas trees in Mexico is far more interesting! According to Historia del árbol de Navidad en México by Hector de Mauleón, prior to 1870, no writers describe the use of Christmas trees in Mexico. By 1890, however, Mexican author Manuel Gutiérrez Nájera (1859-1895) includes the Christmas tree in an inventory of Christmas customs writing that, “¡Tristes aquellos que no tienen un árbol de Noel!” (“Sad are those who do not have a Christmas Tree!”). At that time, small candles were apparently used to illuminate the tree. Historians, including Teresa E. Rohde (1933-1992), generally agree that the Christmas tree was first brought to Mexico during the French Intervention by none other than Emperor Maximilian, whose execution in 1867 brought an end to this unfortunate episode in Mexico’s nineteenth century history. At some point during their three years in Mexico, Maximilian and his wife Carlota imported a Christmas tree from Europe and installed it in Chapultepec Castle, their palatial home. The tree impressed at least some of Mexico’s wealthy families, who began to install their own trees at Christmas time. 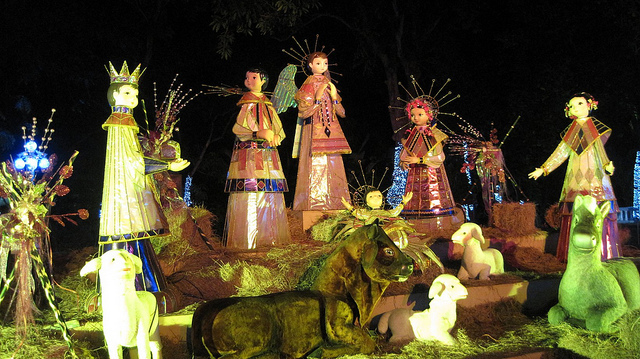 Within a few years, the Christmas tree had become a tradition in many homes and had begun to replace the elaborate traditional nativity scenes (nacimientos). In 1878, General Miguel Negrete, who had fought against the French Intervention, decided to have a Christmas tree in his home. According to some sources, he may have brought the idea back from the USA, independently of the earlier European introduction. His tree garnered considerable press attention. It was decorated with 250 toys. As each of his guests arrived at the house, they were given a number, and later took turns to select a gift from the tree, according to one journalist’s contemporary press account. Despite the popularity of Christmas trees in Mexico, some nationalists continue to decry the practice, considering them a cultural invasion that continues to threaten the much older tradition of nacimientos. Christmas trees are a good historical example of cultural invasion, but at what point (as Hector de Mauleón asks) does a new custom become a tradition? After 150 years, can we now agree that Christmas trees have been assimilated into Mexican culture? Or do we need to wait another 150 years? Wherever you may be, and real tree or not, warmest Mexican seasonal greetings to all! 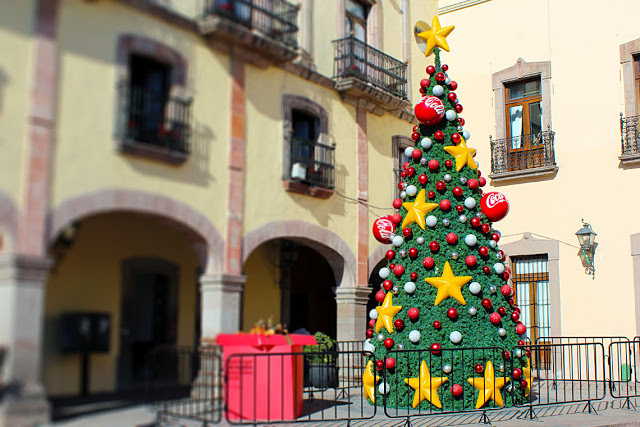 In an interesting follow-up post, Geographic Travels considers the possible “Layers of Geopolitical Myths” behind the introduction of Christmas trees into Mexico: The Christmas Tree in Mexico: Layers of Geopolitical Myths? The 1991-96 cholera epidemic in Mexico originated in Peru in January 1991. It quickly spread northwards, reaching Central America by March and Mexico by July (see map). The cholera epidemic then spread slowly across Mexico before abating. The incidence of cholera was much higher in the Gulf coast states than either inland or along the Pacific coast. By the time the epidemic was over in 1996, more than 43,500 cases had been reported in Mexico and 524 people had died. Much recent attention in the USA and Mexico has focused on the allegations of bribery related to Wal-Mart de México. Interestingly, the company has a rather long history in Mexico. It started in 1958 when Jerónimo Arango and his brothers Placido and Manual started a company called Cifra and opened a deep discount store in Mexico City named Aurrera Bolivar. It was inspired by the E.J. Korvette discount store in New York City. The store was an immediate success, helped by sponsorship of the popular TV show, La Pregunta de los $64,000 pesos (“The $64,000 Pesos Question”). By 1965 Cifra had eight Aurrera stores in the Mexico City area as well as a Superama grocery store and VIPS restaurant. Cifra and Jewel-Osco of Chicago formed a joint venture and by 1970 they opened the first Bodega Aurrera discount warehouse stores and Suburbia department stores. Their first hypermarket, Gran Bazar, followed in 1976. Shares in the company were sold to the public in 1977. By serving low-income customers, the company managed to survive the financial crisis of 1982. In fact during the 1980s it increased sales by an average 20% per year reaching US$550 million by 1989. Rapid growth continued in the 1990s. By 1992 there were 38 Almacenes Aurrera supermarkets, 29 Bodega Aurreras, 34 Superamas, 29 Suburbias (department stores), 59 VIPS, as well as 15 El Portón restaurants. Almost all of these were located in the densely populated Mexico City and surrounding State of Mexico. Phenomenal growth continued in 1992 with 23 new units added. Cifra B shares increased forty-fold in just five years from the start of 1988 through the end of 1992. At that time, Cifra had a sophisticated, state-of-the-art data system for inventory control and monitoring customer preferences. In 1991 Cifra formed a joint venture with the US firm Wal-Mart (founded in 1962, four years after Cifra). Unlike Cifra, whose early growth was based on an enormous urban area, Wal-Mart USA’s incredible early growth concentrated on rural areas. Initially the joint venture focused on trade and the members’ only Club Aurrera, which was soon renamed Sam’s Club. The first map shows the distribution of Wal-Mart stores in 1993. Expansion of new outlets throughout Mexico was only slightly slowed by the 1994 financial crisis. By 1995, there were 22 Sam’s Clubs, and 11 Wal-Marts, 35 Almacenes Aurrera, 58 Bodegas Aurrera, 36 Superamas, 33 Suburbias, as well as 114 VIPS restaurants. One of the new Wal-Mart Supercenters was the largest in the world. The signing of NAFTA in 1994 strengthened the joint venture. In 1997 Wal-Mart USA acquired majority interest in Cifra creating Wal-Mart de Mexico or Walmex. The company, which previously had been heavily concentrated in Metro Mexico City, was soon aggressively opening new units in cities throughout the country (see maps). Recent news reports allege that this aggressive growth may have been facilitated by payments of bribes to expedite construction permits. As of March 2012, Walmex was operating no fewer than 2,106 retail units throughout Mexico. They include 127 Sam’s Clubs, 213 Walmart Supercenters, 94 Suburbias, 385 Bodega Aurreras, 88 Superamas, 358 VIPS and El Portón restaurants, and over 840 Bodega Aurrera Expresses and other small outlets. Wal-Mart de México is the country’s largest retailer, with sales of over US$24 billion, and largest private-sector employer, with 209,000 employees. These figures make Walmex the dominant player in its sector, well ahead of its Mexican supermarket rivals: Soriana ($8 billion); Comercial Mexicana (Mega, $4.5 billion) and Chedraui ($4.4 billion). The 2007 map shows how Wal-Mart has now expanded into some areas where the population density is relatively low. The early expansion of Wal-Mart was into areas with high population density, where a single, well-placed store could easily be accessed by a lot of people, and therefore have the potential to be highly profitable. Even with the 2007 distribution, however, there is still a marked north-south divide in access to Wal-Mart, which reflects income disparities in Mexico. In 2009/10 Walmex acquired Walmart Centroamérica and is now named Wal-Mart de México y Centroamérica, adding 622 retail outlets in Guatemala, El Salvador, Honduras, Nicaragua and Costa Rica, to bring the total number of units it operates (including Mexico) to 2, 728 retail outlets (with sales of about $29 billion) compared to Wal-Mart USA’s 4,468 outlets (with 2011 sales of $447 billion). The maps have been redrawn, based on maps in “Supplier Responses to Wal-Mart’s Invasion of Mexico” by Leonardo Iacovone, Beata Smarzynska Javorcik, Wolfgang Keller, James R. Tybout. Working Paper 17204 of the National Bureau of Economic Research, Cambridge, MA, USA. Where are the wealthiest households in Mexico? Africanized honey bees, sometimes popularly called “killer” bees, resulted from the crossing (hybridization) of European honey bees and African honey bees. They combine the best and the worst of both sets of relatives. Africanized honey bees are slightly smaller than European honey bees, but more aggressive and less inclined to remain in one place. They can swarm and attack even if unprovoked, even though they can sting only once before dying shortly afterward. Their “killer bee” label is because they have killed 1,000 people in the Americas since their ancestors escaped from a laboratory in Brazil. Africanized bees react ten times faster to disturbances than European bees and can pursue a hapless human victim for 300-400 meters. The mixing of genes that created Africanized honey bees occurred in the 1950s. In 1956, Dr. Warwick Kerr, a bee researcher in Brazil, hoped to develop a bee that would thrive in Brazil’s tropical climate. He decided to cross European bees with African bees. Unfortunately, in March of the following year, some of his experimental bees escaped into the wild. The Africanized bees soon began to multiply and expand their range. They proved to be very adaptable, and have since spread, at a rate of up to 350 km/year through most of South and Central America, as well as into Mexico and the USA. They arrived in Peru by 1985 and Panama by 1982. 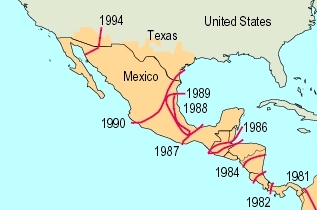 Their spread northwards continued, and they crossed from Guatemala into Mexico, near Tapachula, in October 1986. The map shows the gradual northward spread of Africanized bees in Mexico. Up to 1987, the progression looks fairly regular, but in the following year, Africanized bees’ northward movement was restricted to a zone along Mexico’s Gulf Coast. This remained true even through 1989. By 1990, the “front” of the bees advance once again stretched right across the country. Q. What factors may have caused the unusual (anomalous) geographic spread of Africanized bees in 1988 and 1989? Why are Africanized bees more migratory than European bees? Scientists believe that Africanized bees are uniquely equipped to cope with the unpredictability of suitable food sources in the tropics. They are more opportunistic, changing their foraging habits to suit local conditions, including short-term supplies of pollen, which they will collect and store to ensure their survival. When a new resource presents itself, Africanized bees will swarm rapidly to maximize their use of the new pollen source. In bio-geographical terms, Africanized bees are an example of an opportunistic or r-species, perfectly equipped to move to new or changing habitats. They reproduce rapidly, and use available resources efficiently. This makes them far less stable than European bees which thrive in a more predictable environment and adapt to changing circumstances far less quickly. Africanized bees can survive on limited food supplies, will explore and move to new locations frequently and are aggressive in defending their resources. When they come into contact with other less aggressive bees, such as Mexico’s native bees, Africanized bees may out-compete them for pollen and eventually replace them as that area’s dominant bees. When Africanized bees were reported from southern Mexico, US beekeepers began to fret. The US honey industry is worth 150 million dollars a year. Fear spread that Africanized bees might jeopardize the entire industry, mainly because they are prone to migrate, and would be hard to control. US experts helped finance a joint program in Mexico which aimed to slow down the bees’ progress northwards. The original idea was to stop bees from crossing the narrowest part of Mexico, the Isthmus of Tehuantepec, preventing them from reaching central Mexico. However, by the time funding was approved, some bees had already crossed the Isthmus. The focus of the bee-control plan was changed to trying to slow down their seemingly inexorable progress north. Even if scientists could only delay the bees’ progress, it would give US farmers more time to plan for their eventual arrival. The plan was relatively simple. Hang sufficient bee traps in trees throughout the region to attract wild swarms while banning Mexican beekeepers from moving any hives from southern Mexico into central or northern Mexico. Thousands of distinctive blue boxes appeared in orchards and forests across a broad belt of Mexico, from the Pacific to the Gulf. The combined Mexico-US program is credited with having slowed the bees’ entry into the USA down by about two years. Even so, by 1990, Africanized bees were spotted in Texas; they reached Arizona by 1993 and California by 1995. By this time, they were also found throughout Mexico. In a later post, we will look at honey production in Mexico and see whether or not it was permanently affected by the influx of Africanized bees. (b) Introduced Species Summary Project: Africanized Honey Bee by Christina Ojar, 2002. (c) Alejandro Martínez Velasco. Las andanzas de la Abeja Africana Informador (Guadalajara daily), 1 September 1991. Alongside turkey and/or corn at Thanksgiving and Christmas, the humble yet versatile potato is often eaten. That, too, was introduced to Europe from Mexico (though the plant appears to have originated in Andean Peru). A previous post delved into the connections between Mexico, the potato, and the Irish migration to North America following the potato famine of the early 19th century. But did you also know that potatoes were originally sold in Spain on the strength of claims that they could cure impotence, at prices up to two thousand dollars a kilo? Nowadays, potatoes in one form or another are virtually ubiquitous – from mashed or baked or potato salad, to French fries and the quintessentially Québécois variation of poutine (fries, curds and gravy). Thanksgiving originated in Mexico, not in the USA!